Columbia, Mo. (Sept. 7, 2016) — The Missouri School of Journalism held its annual Walter Williams Scholars ceremony on Aug. 31 to recognize and honor the 2016 incoming class of high-ability freshmen who will study at the Missouri School of Journalism. To qualify as a Walter Williams Scholar, students must have been in the top 20 percent of their high school class, have maintained a GPA of 3.25 or above and have earned qualifying ACT or SAT scores. These scholars are directly admitted into the journalism school their freshman year, given scholarships and assigned faculty mentors. The mentors serve as resources for the scholars, providing guidance and advice. 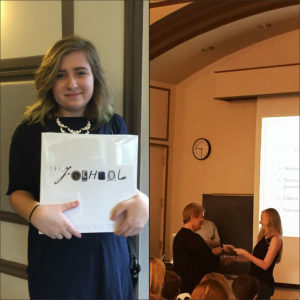 At left, freshman Gabriela Jurkiewicz poses with the commemorative book she received at the 2016 Walter Williams Scholars Ceremony. At right, freshman Natalie Nepper, from Omaha, Nebraska, receives a certificate from her faculty mentor, Professor Maggie Walter. During the ceremony, scholars from all over the country – and an international student – were recognized individually for their accomplishments in high school. Each student received a Walter Williams Scholars certificate and a centennial commemorative book from the faculty mentor. “As a school, we view having talented people as an investment for journalism and strategic communication as they study and enter the profession,” said Lynda Kraxberger, associate dean for undergraduate studies. This year’s ceremony honored 54 Walter Williams Scholars. According to Associate Dean Emeritus Brian Brooks, the program has attracted five times more high-ability students to the School each year since its creation in 2004. The program’s benefits and prestige have helped bring in highly qualified students. Brooks oversees the Walter Williams Scholars program. The Walter Williams Scholars program is the highest level of distinction in the Missouri School of Journalism. Other benefits for each scholar include a $1,000 scholarship to study abroad or participate in the School of Journalism’s New York or Washington programs and an automatic admission to the School’s one-year master’s degree program.